The importance of a robust business continuity plan is once again being brought into focus with recent extreme weather crippling businesses across the globe. An arctic-like deep freeze in US cities and a menacing blizzard in the UK are preventing people from going to the office. But should everyone really stop working? Currently, Chicago, Boston, and other cities in the midwestern and northeastern US are being hammered by a polar vortex—and it’s brought business to a standstill. The record subzero temperatures have not only frozen the Great Lakes and Niagara Falls, they have also grounded 2,000+ flights, disrupted rail services, and caused traffic accidents. In the UK, intense blizzards are causing similar disruptions. Stranded motorists are being forced to abandon their cars, flights are being cancelled, and hundreds of schools are shutting down. In extreme weather conditions like these, people are urged to stay indoors for their own safety. In the past, businesses had no choice but to absorb massive losses due to zero productivity. But it doesn’t have to be that way anymore. 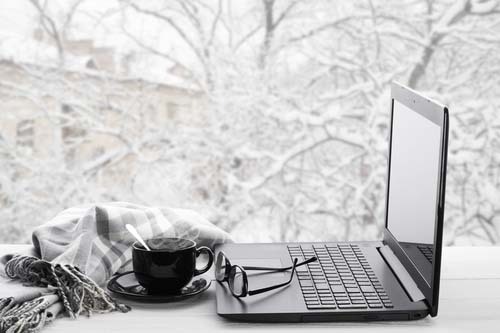 Today, businesses can avoid or minimize productivity loss by enabling employees to continue working in the comfort, warmth, and safety of their homes. This is possible with the advent of broadband Internet and remote access, which allow employees to access work-related documents from an office server, their corporate datacenter, or the cloud. While it’s possible to simply download files, work on them locally, and then re-upload them when done, this practice is susceptible to oversights. What if an employee forgets to upload the right version of a file they’ve been working on? Or worse, what if corporate files containing sensitive data are downloaded to an employee’s personal laptop—and that laptop gets lost or stolen? Instead of downloading/re-uploading files, it’s easier and more secure if employees work on virtual desktops and applications. That way, the files they work on can stay in one secure place (i.e. in a centrally managed server). There’s no need to re-upload files or worry about data leaks. One virtual desktop and application delivery solution that can help ensure business continuity is Parallels® Remote Application Server (RAS). Parallels RAS delivers virtualized applications, desktops, and data to any device, anytime and anywhere there’s an Internet connection. And it does this while keeping data secure in your on-premise datacenter or cloud infrastructure. In addition, Parallels RAS has load-balancing capabilities that enable it to spread workloads across underlying servers. This is especially useful when employees are forced to work from home and your virtual infrastructure gets a sudden surge in demand. Try Parallels RAS for free. TechTarget: What is business continuity?